The Birmingham Film Festival launched its third consecutive year earlier this week with the premiere of the movie, ‘Of God’s and Warriors’. 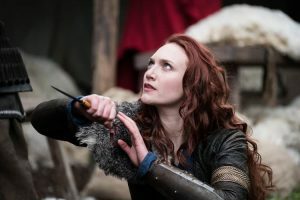 Tuesday night’s event started with a bang, as a role-playing traditional Viking sword fight stunned the audience at the Millennium Point cinema. The cast and crew of the film also attended the premiere and took part in a Q and A session after the film. ‘Of God’s and Warriors’ portrays a compelling story of duty and service alongside Viking Mythology with stunning landscapes and some vicious fight scenes. The Birmingham Film Festival spans along the whole week and ending on Sunday, the 25th of November. 200 films are being shown over the 6-day event including shorts, features, documentaries, animation and music videos along with specialized workshops and seminars. The Gala Awards ceremony will be held on Saturday to a sold-out audience.